We have featured a few nice Chobi Cam mini digital cameras. 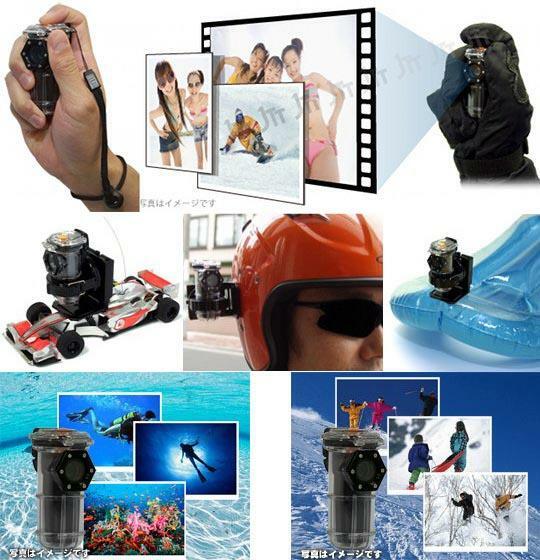 But if you want to take photos underwater, the following Chobi Cam Sports Gear mini camera may be more suitable for you. Chobi Cam Sports Gear is a practical waterproof, ultra compact camera that measures 2.1 x 5.7 x 2cm and weights approx 29g (with waterproof case). As we can see from the images. the mini camera features a unique vacuum tube-like design, and using the built-in CMOS sensor, the mini camera allows you to take still photos in 1280 x 960 pixels resolution or record videos in 736 x 480 pixels resolution at 30fps. Moreover, the mini camera has an accompanying waterproof case in order that you can take it underwater up to 12m for those awesome scenes. Apart from that, the waterproof camera has 4GB internal storage, and is powered by a built-in rechargeable battery. Chobi Cam Sports Gear waterproof mini camera is priced at $175 USD. If you’re interested, jump to Japan Trend Shop for more details. Additionally, if you need other options, you might like to check another Chobi waterproof mini camera.